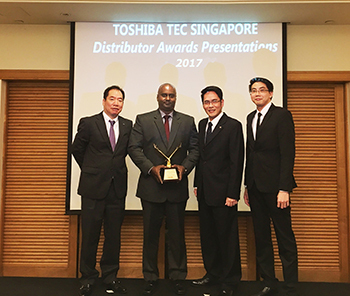 John Keells Office Automation (JKOA) has proven itself to be a true game changer by securing the Diamond Award at the Toshiba Annual Distributor Meeting 2017, for the fourth consecutive year. JKOA was recognised for its performance in financial year 2016/17, during which the company sold a record number of digital multifunctional copiers to its clientele across Sri Lanka. It saw a 25 percent year-on-year increase for overall copier sales in 2016 while Toshiba’s colour copier range recorded 30 percent growth in sales. Given its efficiency and cost effectiveness, the company’s Managed Print Solution business, which debuted in 2014, saw a sharp increase in demand in the year under review.